If there was only ONE dish that my son could eat everyday, it would be this one! He loves it so much, he even insisted that I teach him how to make it, and that’s saying a lot for a 14 yr old boy. Sadly, it’s one of those dishes that isn’t very interesting to LOOK at…but man, is it every tasty, like a party in your mouth! What sets it apart from most other curry dishes is the BRIGHTNESS of the flavor, due to the lemon juice and tomatoes. And the ONIONS! Even if you have an onion-hater (like my boy), still give this a try. They cook down so much you don’t even taste them, but they add a wonderful sweetness to the dish. 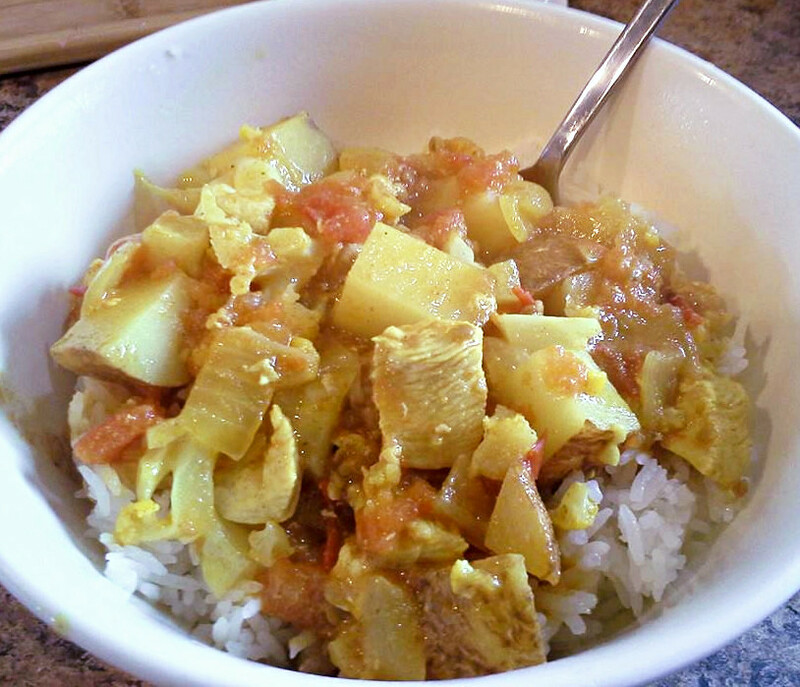 I first started out with this African curry recipe, and over time it transformed into what you see below. Maybe it’s due to my Asian roots, but I just can’t consider a curry dish complete without potatoes and some hearty vegetables 🙂 We usually eat this over rice, but it would also be great with naan or a crusty loaf of french bread! Not all curry powders are the same. We currently use the Oregon Spice Hot Madras curry powder from Azure Standard and really like it. In the past have also used “garam masala”, a curry powder mix you can easily pick up from a large grocery store or Asian market. Really it’s a personal taste thing. 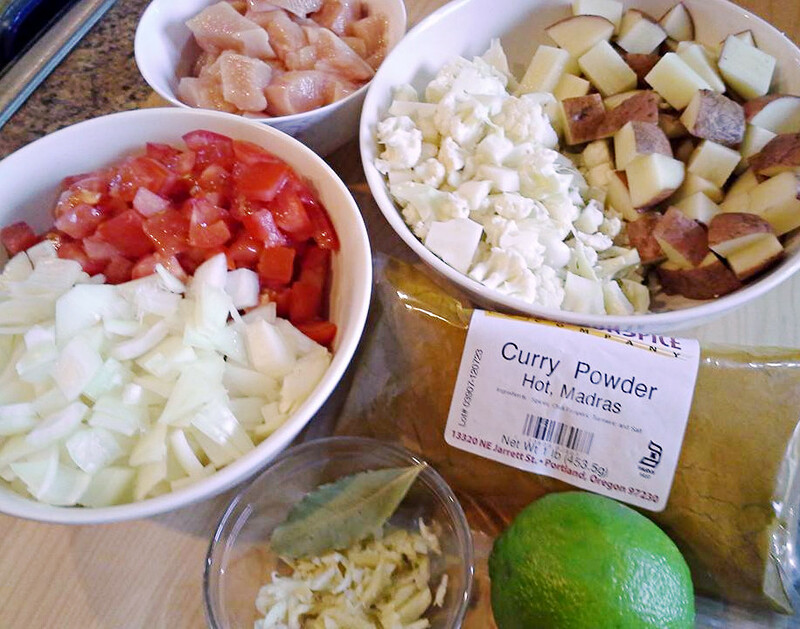 While the curry powders usually have similar ingredients, it’s all about what PROPORTION is used of each. I found the garam masala we had before a bit too heavy with turmeric. So if you find that the curry powder you use isn’t quite to your liking, try a different one, or even making it yourself, as it’s simply a blend of dry spices and there are lots of recipes for it on the internet. the tomatoes. We have used both canned and fresh tomatoes, and MY preference are the fresh ones, as it creates a smoother/silkier curry sauce. The canned tomatoes still taste fine in this dish, but they do not break down nearly as much, so you’ll have lots of tomato “chunks” still in the sauce. the meat and veggies. This is a very flexible and forgiving recipe. You can use less, more or even no meat, and the ingredient list is vegetarian/vegan friendly. Feel free to tailor it to your liking and/or according to what you have on hand. For us, it’s just not the same without potatoes (even though the original recipe doesn’t call for any), and we’ve used chicken breast, steak, ground beef, even ground pork. I think chicken breast is our favorite, though really I’m not sure, as we always gobble it up no matter what is used! timing. The directions given are based off of the ingredients we normally use – potatoes, chicken, and cauliflower. If you use different vegetables just keep in mind that the time needed to cook them will be different then the times I mention in the directions, so a little timing intuition is called for in this dish. Don’t be afraid of this dish though, you get better the more you make it! MEAT – 3/4 to 1 pound. If chicken breast, pork chop or steak, cut to bite sized. In a large pot or dutch oven, heat the olive oil over med-high heat. Add in the garlic and bay leaf, sauté for 30 seconds and then add in the onions and let them cook for about 5 minutes, stirring frequently. Add in the tomatoes, curry powder, 2 tsp salt and the brown sugar. Stir well, then cover the pot and turn the heat down to medium-low and simmer for 5 minutes. 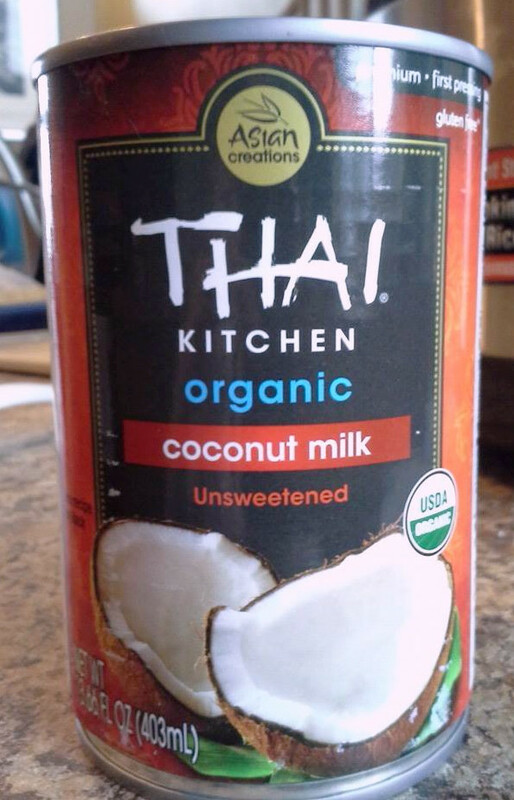 Add in the coconut cream. At this point I add in my cubed potatoes, as they take the longest to cook out of the ingredients I usually use. Cover and simmer for 7-8 minutes. Add in the chopped cauliflower and cubed chicken breast, simmer for another 6-9 minutes, or until the potatoes and cauliflower and to your desired tenderness. **If you are using a ground meat – gently drop in meatball-sized chunks and CAREFULLY cover with some of the sauce. Allow it to cook a few minutes before stirring, or else the meat will break apart too much. Lastly, add in 1 TBLS of lemon or lime juice. Give the sauce a taste and adjust the spices as needed. I usually end up adding in a little more salt and use a full 2 TBLS of our curry powder. And I LOVE lime, so I always add an extra squeeze in my bowl 🙂 **If you prefer it thicker, you can add a little cornstarch + cold water slurry in at the end.